Our Basic Manners class teaches basic skills and how to apply them to living with your dog. The first session is a private session in our training room followed by 4 consecutive weeks in a group class. In the first private session we cover the foundation behaviors that we build on during each subsequent week. 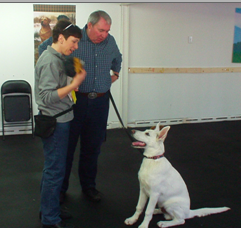 The private session builds your skills and your dog gets a chance to train in the room without distractions. The next 4 weeks focus on building on these skills with more distractions. We cover such topics as stay, come, walking nicely on leash and more…. Also discussed are common behavior problems such as jumping, chewing on inappropriate objects, stealing objects, and other topics of interest to the class. The cost for Basic Manners is $195. Mondays or Thursdays from 6:15 – 7:15 in Chestnut Ridge or New City. Thursdays from 10 AM – 11 AM in Chestnut Ridge or New City..
Saturdays from 11 AM – 12 PM in Chestnut Ridge or New City. Don’t wait, sign-up now. Call us, send us an email or fill out the Contact Us form on this website.